Welcome - you are in the market for a sign, and we are here to help! All ShieldCo custom metal signage is custom designed, laser cut from steel or aluminum and industrially powdercoated. We use only high quality stainless steel hardware and finishes for a piece that will last lifetimes. We produce a better product at a better price than our competition - shop around and see. Personalized Service: Work directly with us, the owners, Luke & Neil to make your custom design a piece of art. We are honest, responsive, and detail oriented. Custom Sizing: Big enough for your main business sign or small enough for the perfect gift. High Quality: High grade laser cut steel or aluminum, industrial powder coating, and hand assembled. Feel Good: Veteran owned. A portion of all profits are donated to The Pointe du Hoc Foundation, a 501(c)3 that supports US Army Rangers and their families. Pricing starting as low as $500. With LED lighting for a sign that is truly unique! LED lighting was added behind the front layer of the sign to give the acrylic letters a great glow! Custom laser cut sign that we gave patina look to. We make custom wooden crates to ensure your product arrives to you in perfect condition. From Maryland to Florida, California, Hawaii and even American Samoa, our shipments will arrive in perfect condition. We ship UPS for the majority of our orders and freight for the larger ones. Shipping is always included in our prices. 100% shipping rate without incident. ShieldCo can help you design, manufacture and install your 3D custom signage - inside or out. ShieldCo brings your business logo to life by creating a UNIQUE 3D representation. All our custom business signage pieces are individually powdercoated for a finish that is vibrant and durable. 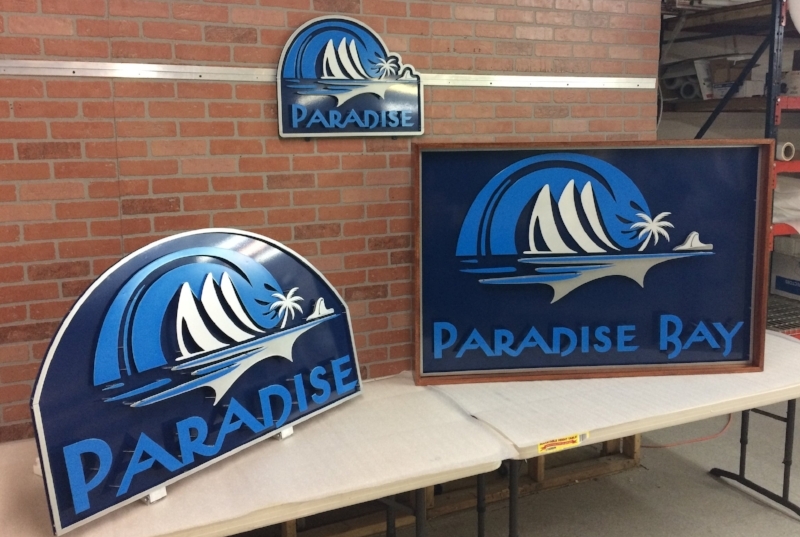 ShieldCo can create 3D custom signage pieces from small entry way pieces to full size outdoor pieces. 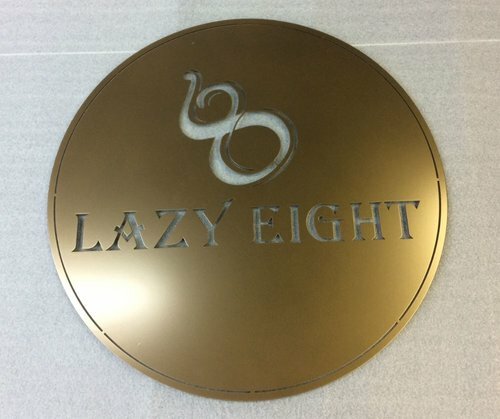 Most of our 3D custom Metal signage comes ready to install with hardware included. Our custom business signs "Shields" can be installed by one person in minutes with standard tools. ShieldCo 3D Custom Metal Business Signage can be installed in minutes. For larger pieces we use aluminum, making them light enough to hang in just drywall. Also, they can be removed and moved to another location with ease. WE HAVE WORKED WITH NATIONAL Organizations and are ready to turn your brand's logo into 3d Art. WE HAVE CREATED 3D CUSTOM METAL SIGNAGE FOR LARGE NATIONAL ORGANIZATIONS AND CORPORATIONS INcluding pepsi, the Brooklyn nets, lyft, the national realtors association and the university of maryland - to name few. If you like, we can incorporate different materials to match your business identity - here is an example using Hand Hammered Copper. For a piece that will grab Everyone’s attention. Start Your Lighted Sign Here! WE CAN MAKE YOUR SIGNS MAKE A POWERFUL STATEMENT TO YOUR CUSTOMERS. Every office location needs signage to indicate their presence. Interior custom metal signage is as important as exterior signage. Study after study have been conducted showing how much first impressions affect someone's perspective of a location. A great way to ensure their first impression is positive is to adorn your space with beautiful custom metal commercial signage. When the Brooklyn Nets contacted us late on a Friday in February of 2016, they said that they loved our custom metal signage and that they needed two new signs for their practice facility in Brooklyn, NY in a little less than two weeks. We worked with the manager at the Nets, creating mockups for their review over the weekend, and sealed the deal the following Monday. We delivered on time and hung the commercial signage for their opening ceremony. Pepsi was renovating their office space in Denver, Colorado and wanted new custom metal signage that would update the space to make it look modern and fresh. On the first call with the facilities manager we presented 3D models of our vision of the signs which were perfectly inline with what the company was looking for. We worked diligently with our supplier of powder coats to find the perfect color match for the Pepsi brand and then we started production. We laser cut, powder coated, assembled and shipped the signage for Pepsi to their office. Within two hours of receiving the package the new signage was flawlessly installed on their wall. The client had a great looking logo that they wanted to update to something more impressive. 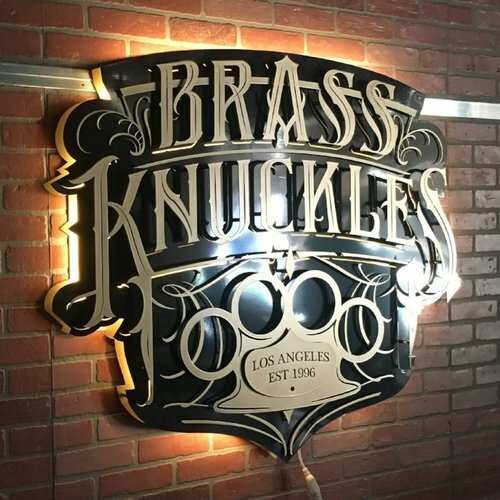 After working directly with the client on developing the logo, the client had the suggestion of putting ball peen hammered copper as the backer for the custom metal signage. This was the perfect suggestion! The hammered copper is unique and regal and will be a focal point of the office for years to come. This sign is the truly perfect entry way sign for an office or commercial building. FROM BIG CORPORATIONS TO UNIVERSITIES TO LOCAL BUSINESSES, SHIELDCO CAN CREATE A CUSTOM SIGNAGE PIECE THAT WILL GRAB PEOPLE’S ATTENTION. CREATE YOUR SHIELD. Each "Shield" 3D Custom Metal Signage piece starts with a custom design. Just send us your logo or design and your desired size and we will create a 3D rendering of your project for your approval. If you don’t have a logo or design yet, thats ok, we can help you design one. Here is an example of what we created for the Paradise Bay Resort in Hawaii. AS WITH ALL OUR 3D CUSTOM SIGNAGE PIECES THE DESIGN BEGINS IN AUTOCAD, WE CAN MATCH EVEN THE MOST COMPLEX LOGO WITH PRECISION. Then we completed fabrication and the client asked us to add a mahogany frame to the sign as well. HERE ARE SOME OTHER FAVORITES - WE CAN ADD CUSTOM LIGHTING OPTIONS FOR A PIECE THAT REALLY STANDS OUT. OK, THIS IS REALLY OUR FAVORITE PIECE. 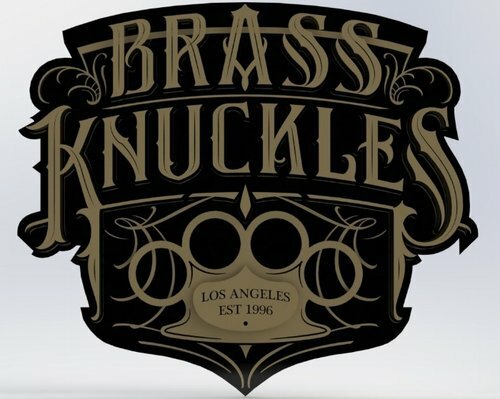 IMAGINE YOUR LOGO IN ALL STAINLESS! OR COPPER! LET US KNOW, WE CAN SEND YOU A CUSTOM 3D RENDERING. Turn Your Logo into a Piece of Art. ShieldCo creates one-of-a-kind custom signage using a unique 3D technique for a piece that will stand out and last lifetimes. 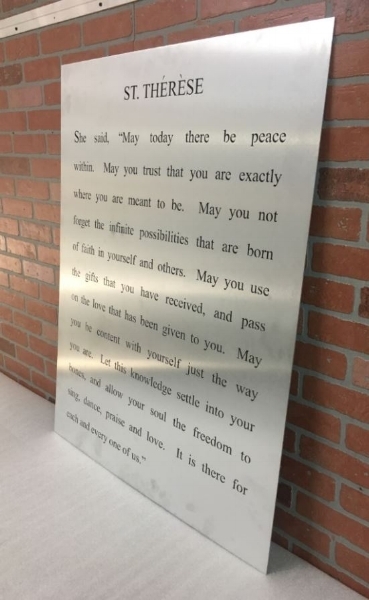 HERE IS ANOTHER 3D CUSTOM METAL SIGNAGE PIECE IN ALL STAINLESS STEEL, BUT MUCH LARGER AND OUTDOORS, CREATED FOR A LOCAL BUSINESS. Left to Right: Luke Markey, Peter Markey, Neil Markey - Owner's of ShieldCo and creators of our 3D Custom Metal Signage designs that we ship from the Washington DC metropolitan area to all areas of the country - from Manhattan, New York to Los Angeles, California.